Phuketindex filmed a little before the rains came on Wednesday November 24, beside the beach near Soi Bangla, Patong Beach, Phuket, where Tri Akkaradecha, Governor of Phuket, presided over a Preview and Press Conference at Patong Beach, Phuket on the 25th annual Phuket Carnival. The Mayor of Patong, the Assistant Director of the Tourism Authority of Thailand, Phuket Office, President of Patong Hotel Association & Regional Marketing Manager of Thai Beverage Plc, Ltd. Phuket Provincial Police Commander and government agencies and private agencies also attended. The carnival used to be held in November but as the preview showed, the rain can still dampen events, so they in the last 2 years they moved the carnival to December. The ‘Phuket Carnival 2010’ will be held during 15-20 December, when the weather should be dry, at Patong Beach, Kathu. The major event sponsors are Patong Municipality Office and Thai Beverage Public Company Limited (Chang beer). Visitors, and residents too, can enjoy a street parade, with brass bands like the Royal Thai Navy filmed here, concerts from GRAMMY, Thai Traditional Shows, Arts on the Beach, cabaret artists (like those also filmed here as they were due to go on stage, if/when the rain stopped) and many more games and activities. The Governor said later that Phuket province is a beautiful tourist destination for tourists and is known around the world. Specifically, Patong Beach is a tourist attraction that many visitors come to see each year and can generate a lot of revenue for Phuket and Thailand. The carnival signals the opening of the tourist season annually. 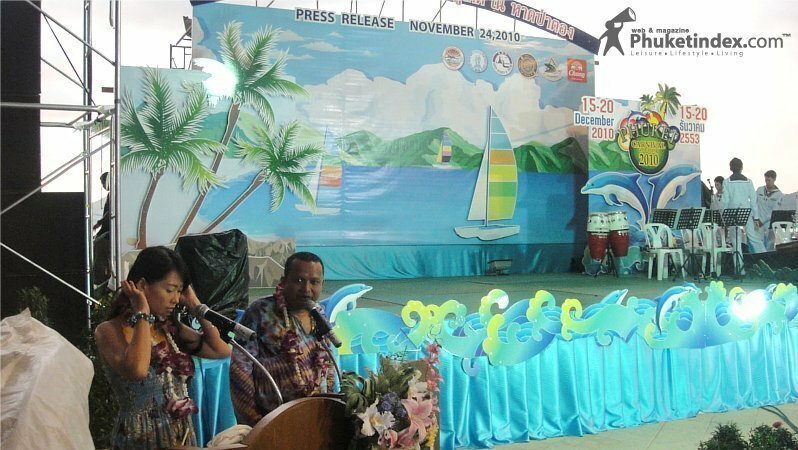 This event promotes and supports activities for tourists, to travel around the province to know more. In addition, the province has organized different tourism activities but locals should not take advantage of tourists, give a good impression to visitors so they will travel to Phuket again. Also the public sector and business-related tourism have to help conserve natural resources to create sustainable tourism of Phuket forever, the Governor said. Mr. Pian, the Patong Mayor, said that Patong Municipality is pleased to be opening the tourist season in Phuket at Patong Beach; the 25th Carnival will be held in order to promote tourism in the area, with a variety of activities for tourists. The Carnival opening ceremony will be held on December 15, beginning at 17:00. There will be a grand parade on Patong roads in two forms, which is the combination of vehicles decorated with natural materials and floats decorated with colorful lights. The parade will reflect the beauty of costumes from legends about Thais and civilization eras. They expect to see at least a hundred thousand people during the carnival. Ms. Wannapa, Assistant Director of TAT Phuket office, said together with other agencies, they have helped activities to promote tourism in Phuket during the high season. The plan is organized into several areas, in order to promote and attract tourists to visit all of Phuket more. In the hotels, such as in Patong, 80 – 90 % of rooms are fully booked and throughout the region about 80 to 90% are expected to be filled from December to the Chinese New Year in February. Many visitors will be in Phuket, circulating several hundred million Baht in spending.